I told you I'd get back to the Getting To Know gang. Another terrific series they've done takes kids into the world (and the paintings) of some famous visual artists - which you might think would be somewhat challenging to describe for people with vision impairments. The animated characters of the artists themselves do a pretty great job at describing their own styles and the historical or personal contexts that inspired them. I just help them along. Here's a clip from the one about Vincent Van Gogh, which also doesn't ignore his mental health difficulties. The folks at Getting To Know Inc. take their name pretty seriously - although they're lighthearted about it. Their short animated videos do a lot of good helping kids get to know some quite complex people and concepts. You'll probably be hearing about more Getting To Know series in the weeks to come, because they're fast becoming favourites on the DCMP roster (and with me!) this year. Our first series with them focuses on U.S. Presidents, making lofty historical figures relatable and sometimes funny. The sample below introduces Abraham Lincoln as he starts telling the story of his life. 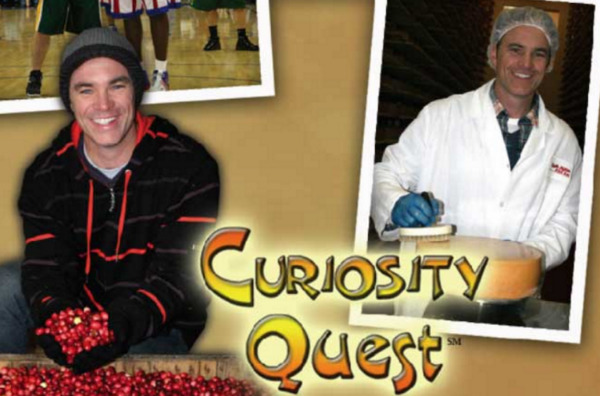 The Curiosity Quest logo is shown between two photos of host Joel Greene. On the left, he holds handfuls of cranberries. On the right, he wears a white lab coat and hairnet. Photo from Green Planet Films. Joel Greene can be a bit goofy sometimes, but the scrapes he gets into are all part of his mission of answering questions that kids have about anything and everything. It's been fun keeping up with him on Curiosity Quest, a long-running PBS series best-known in California, which sends Greene all over America to get answers to questions kids send in about subjects ranging from basketball to toothpaste to innovations in recycling. In the clip below from one of the episodes where I wrote the description, a letter about printing presses leads to a trip to a publisher of Braille. I'm not really a science-y person, so this fun series from the National Science Foundation bodes well for kids who are like me. Hosted by former CNN science reporter Miles O'Brien, Science Nation travels the world for fascinating and inspiring science stories told in bites of several minutes. Below is a sample from one episode I wrote description for, about improving the sense of touch in robots and prostheses. Anyone remember the '60's film Fantastic Voyage? This educational series I've been working on gets even more fantastic, as a super-tiny computer-animated crew of scientists and adventurers encounters a huge world of one-celled organisms, challenging currents and creepy crawlies - using actual microscopic footage. In this clip, the good ship Cyclops begins its journey. If you've watched any of my work with the DCMP on the Video Samples page, you'll have noticed their videos are accessible for students who are blind and students who are deaf. When I received a series of videos of children's books presented with American Sign Language (ASL) and already captioned, it came with a challenge for me as a describer: what do I do about the sign language? While there are different answers to this depending on the project, for this one, we decided to establish what was being done in terms of text and sign, along with taking advantage of the space given for the wonderfully expressive ASL interpreters to perform by describing some of what they were doing. This helps a vision-impaired audience to associate some of the signs with the words of the story, learning along with their hearing-impaired friends, as well as those with sight and hearing. Inclusiveness in action!